The Lipscomb men’s soccer team might have been an underdog, but this Cinderella packed quite a punch. The Bisons began the tournament by taking down No. 17 Washington and No. 9 Central Florida, which both clearly underestimated the upstart Lipscomb squad that turned a 1-7 start into an ASUN title. But Lipscomb’s final opponent was not caught napping. Kentucky was simply too well acquainted with the Bisons after the two squads met in each of the last three regular seasons. Kentucky used second-half goals from Jason Reyes and Bailey Rouse to eliminate Lipscomb and advance to the Elite 8, bringing the Cinderella story to a screeching halt. “They’re just good,” Lipscomb coach Charles Morrow said of the Wildcats. “The fact of the matter is, you look at [Kentucky], you look at UCF and you look at Washington, player for player athletically, the teams we’re playing are just better. You don’t have to look any further than the team’s most experienced (and arguably best) players to find more underdog tales. Forward Logan Paynter and goalkeeper Chris Zappia began their Lipscomb careers as redshirt nobodies, but the fifth-year seniors are now leaving the program as two of its best players in recent memory. Paynter, a former walk-on, and Zappia were roommates for their freshman season in 2014. Both shared in the frustration of sitting out after being the stars of their high school teams. Paynter was lightly recruited and chose Lipscomb over Fordham and Rollins College. He quickly proved any doubters wrong by leading the team with six goals in 2015, and he tallied his final collegiate goal Saturday night to push his career total to 36 – a program record. Zappia worked behind future pro goalie Micah Bledsoe during his first three years on campus. But the North Carolina native seized his opportunity to start last season, and the 6-foot-2 keeper picked the NCAA tournament to play some of the best soccer of his life (he made 23 saves in the three games). Much like Paynter and Zappia, this year’s Lipscomb team had its own coming-of-age story. After graduating 10 seniors and replacing many of them with freshmen, the Bisons struggled to finish games in the first half of the season. 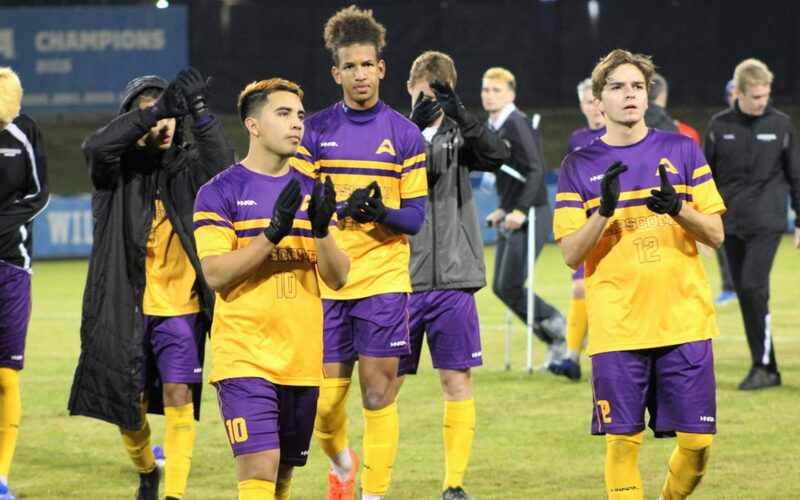 Five of Lipscomb’s first seven defeats were by one goal or less. But Lipscomb finally snapped its seven-game losing streak with a 3-2 upset of No. 24 Florida Gulf Coast on Sept. 29, beginning an unprecedented run that included a win at No. 10 Louisville, a conference title and two NCAA tournament road victories. Four Lipscomb newcomers – Louis Robinson, Daniel Zapata and Noah and Scott Gulden – landed on the ASUN All-Freshman team. And two more freshmen, forward Zarek Jakubowski and midfielder Ryan Dougherty, each played plenty of meaningful minutes down the stretch. Despite the graduations of Paynter, Zappia, Ryan Birchfield, Trystan Innes and Austin Strout, the cupboard will be far from bare in 2019. This Lipscomb team had the luxury of flying under the radar, only to surprise ranked teams with its combination of an impossible-to-crack defense and an aggressive attacking style. “I hope that it encourages other programs, other athletes that are in the [Lipscomb] athletic department that just because we are a mid-major doesn’t mean we can’t compete at the highest levels,” Morrow said. Future Bison soccer teams won’t be able to sneak up on anyone. And that’s a sure sign of progress, especially for what appeared to be an underdog – at least on paper.